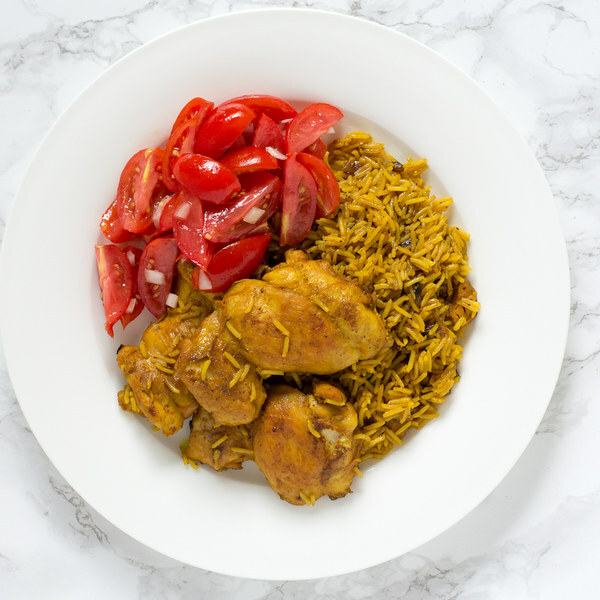 ← One-Pot Turmeric Chicken & Basmati Rice with Tomato Salad. In a medium bowl (that will hold the chicken), combine and mix together olive oil, turmeric, salt, and pepper. Pat the chicken thighs dry with paper towels and place in the marinade; gently toss until well coated. Once the pan is hot, carefully add the chicken thighs; cook until they are browned (but not cooked through), 2 to 3 minutes per side. Transfer to a plate. While the chicken cooks, trim off and discard the ends of the onion and remove the outer layer; small dice the onion (cut into ¼-inch pieces) and transfer to a small bowl. Once the chicken has been transferred, reduce the heat to medium. Add olive oil and the ½ of the onion to the pan (save the rest for the salad); cook, stirring frequently, until the onion is softened, 3 to 4 minutes. Using a strainer or colander, rinse the rice under cold, running water. Add the garlic, turmeric, salt, and pepper to the pan; stir until fragrant, 15 to 30 seconds. Add the rice to the pan and stir until coated with the spices and oil. Then, pour the broth into the pan, stir to combine with the rice, and bring to a boil over high heat. Once boiling, reduce the heat to a simmer, return the chicken to the pan, and cover with a lid. Cook until the broth is absorbed and the chicken is cooked through, 12 to 15 minutes. Wash and dry the tomatoes, then cut them into thin wedges and transfer to a medium salad bowl. Add the remaining onions to the salad. Drizzle the salad with olive oil and season with salt and pepper; toss to combine. Once the chicken and rice are cooked, transfer the chicken to a plate and fluff the rice with a fork. To serve, divide the rice between plates and top with the chicken; serve with tomato salad on the side. Enjoy!